1903 The new Association set out for Ottawa to demand that their complaints be heard and dealt with by the government. It took until the end of that year for the government to respond with a 10% wage increase. 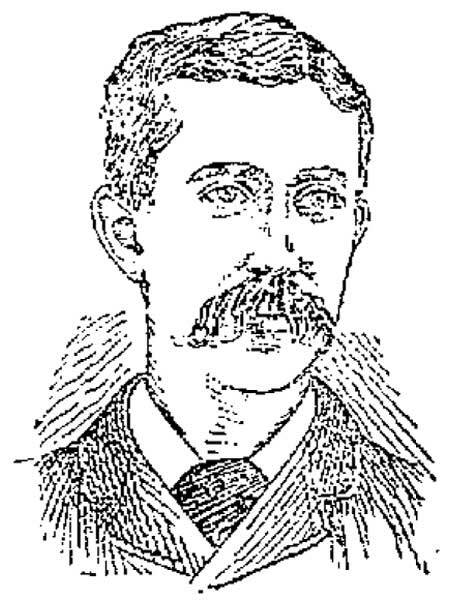 As a result of this success, Ira Stratton and his colleagues decided to organize in the other provinces. By 1904, Mr. Stratton knew that Ottawa was paying attention: it was difficult for the government to ignore so many voices all giving the same message. He and his colleagues headed east. 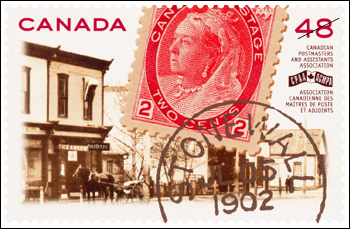 1906 In April of 1906, the first meeting of the Ontario Postmasters Association was held and the first National Meeting of the Canadian Postmasters Association, with twenty-one delegates from six provinces, was also held in Ottawa. Six thousand Postmasters signed a petition requesting increases in salary, rent, heating, and lighting allowances that was presented to the Postmaster General, Mr. Rodolphe Lemieux. 1907 The provinces of Quebec, New Brunswick, Nova Scotia, and Prince Edward Island organized their own branches. By 1910 the provinces of Saskatchewan, Alberta and British Columbia had also organized branches. When Newfoundland joined Confederation in 1949, they too became organized. 1913 The implementation of rural routes added an extra burden and more expenses for the already overworked and underpaid Postmasters. By 1913, eighty-eight post offices had been forced to close because of financial losses. By 1914, only two branches, Ontario and New Brunswick, remained functional. Before the First World War, Postmaster positions were all held by men. When World War 1 was declared, the men left to fight the war and women replaced the men as Postmasters. That was the start of the CPAA’s predominantly female membership (today, 95% of CPAA members are women). 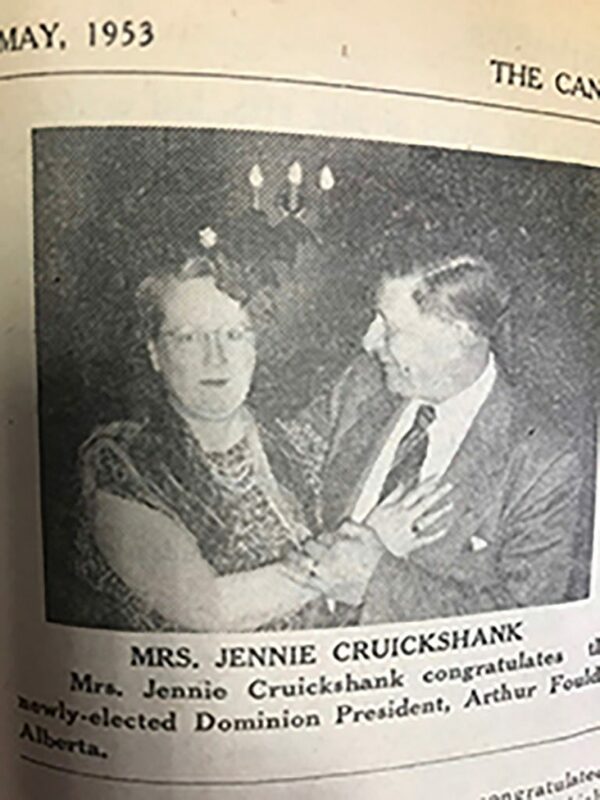 However, CPAA did not elect a woman to any position until 1950, when Jennie Cruickshank was elected in the Maritime Branch. 1919 By the end of the war, Ontario was the only functioning branch, Along with other Postmasters from across Canada, it devised the first constitution for the Canadian Postmasters Association (what we know today as our bylaws). The $8,600 left in the Ontario fund was transferred to a national fund. A National President, a National Vice President, and a National Secretary-Manager were elected. These officers worked on a part-time basis from their own post offices, time permitting. Their task was to reactivate the Postmasters nationwide to lobby the government for compensation for providing premises, equipment, and supplies as well as better pay and to reduce the hours of work. Over the ensuing decades, the Association fought schemes from the government, such as salaries based on office revenues or on the number and value of money orders issued. 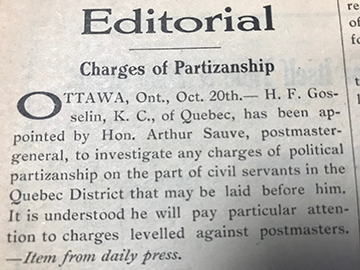 This is a page from the 1927 issue of The Canadian Postmaster, the CPAA’s national newspaper. The original newspaper, The Postmaster, was published from Estevan, Saskatchewan, in English only, although content in French was sometimes included. In 1961, the newspaper became fully bilingual. During the 1930s, the Association lobbied for Postmasters to be included in the civil service. While some politicians agreed and promised support, once elected, they preferred their own patronage appointments. 363 Postmasters were fired because of allegations of political “partizanship” and all Postmasters were required to pay 10% of their gross earnings back to the government, as was the law under the Civil Service Act. At this time, Postmasters worked 7 days a week, starting at 4 a.m. in the morning to meet the train and finishing at 11 p.m. If they had too much work and needed an assistant, they had to pay that wage out of their own pockets. Supplying facilities, heat, light, equipment, and all the supplies needed to run the office were still the Postmaster’s responsibility. The Association was able to obtain Christmas Day and New Year’s Day as statutory holidays, but, when they requested a shorter work week (closed on Sundays) the government imposed a one-hour opening on both Christmas Day and New Year’s Day in exchange for the 6-day work week. 1943 Postmasters became eligible to be part of the Civil Service Superannuation Fund (pension) and in 1944, they received a 10% cost of living raise. In 1946, The Deputy Minister stated that all Postmasters in rural post offices should have full-time staff and run their post offices like a business. 1948 In April of 1948, all Canadian post offices were classified into two categories: Groups 1 to 30 were deemed revenue Postmasters who had their offices, rent, heat, and light paid by the post office. Groups 31 to 35 were semi-staff offices paid by the Department of Public Works. All Postmasters in categories 1 to 35 became full-time civil servants entitled to superannuation, annual leave, sick leave, and expenses paid for by the government. By 1951, more than 13,000 postmasters had been changed from commissioned agents to salaried employees. In 1953, the Post Office Department underwent major changes and the unit of work survey was invented and implemented. 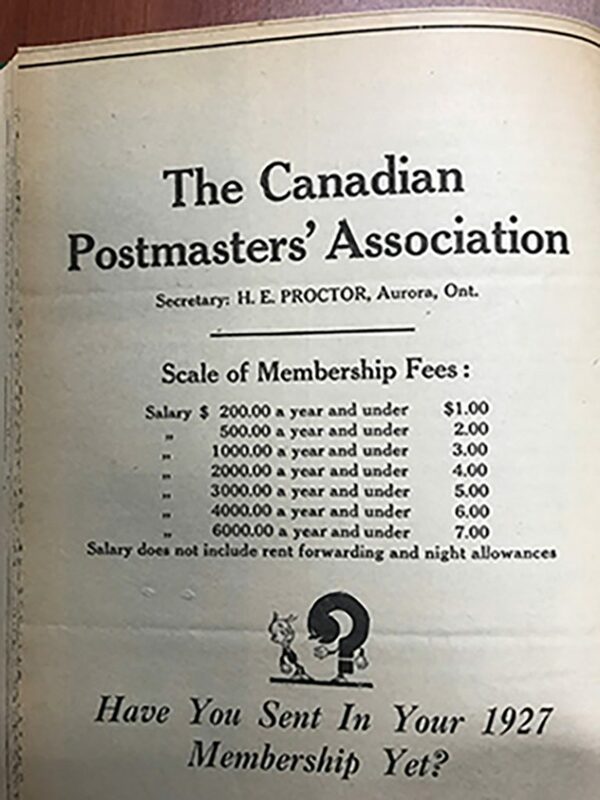 1956 The Canadian Postmasters Association changed their constitution, setting up Branch Executive Officers, and a Board of Directors. During this period, each branch had a Manager Secretary-Treasurer appointed by the Board of Directors. (In 1966, the first full time Secretary-Treasurer was appointed for the Association.) In 1964, the Association began to offer liability insurance to its members. 1966 The Association decided to apply to be certified as its own bargaining unit rather than affiliate with other groups such as the Canadian Union of Postal Workers (CUPW). 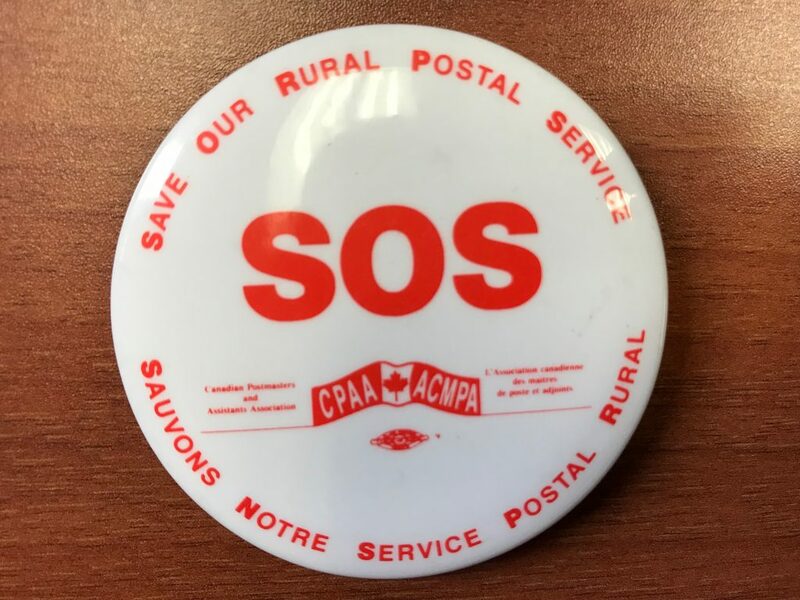 In April 1968, the Public Service Staff Relations Board certified the Canadian Postmasters Association as the official bargaining agent for the Revenue Postal Operations Group. The Association prepared to negotiate its very first collective agreement. 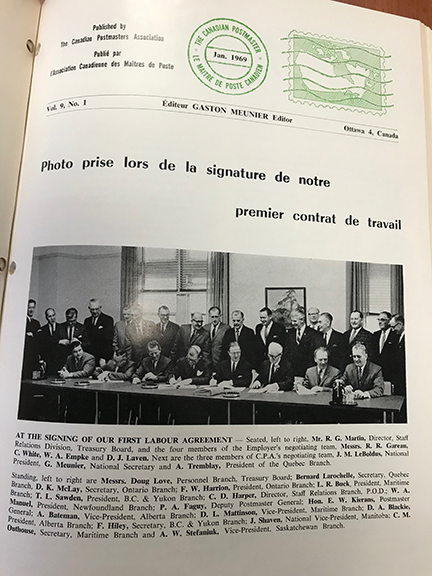 Page from the January 1969 edition of The Canadian Postmaster, showing the signing of the CPAA’s first contract. The Post Office Act was changed to prohibit patronage appointments of Postmasters. The process of applying and being interviewed for the position of Postmaster became a reality. On October 17, the first contract was signed between the Association, Canada Post Corporation, and the Treasury Board, giving full time employees an 8-hour work day with two (2) 10-minute breaks per day, plus many benefits that we have today. In late October, the Canadian Postmasters Association approved, ratified, and sanctioned a new constitution and voted that the National President, John LeBoldus, assume a full-time status and reside in Ottawa. 1973 The method of handling disputes with Canada Post was changed from binding arbitration to conciliation with the right to strike. CPAA continued to bargain with the Treasury Board until 1981 when André Ouellet became the first Minister responsible for the new Crown Corporation Canada Post and the last Postmaster General. 1975 At the fourth National Biennial Convention, held in Victoria B.C., the membership elected their first National Vice President. The first National Board of Directors was formed, including a president for each branches and national officers. Our name was changed to today’s Canadian Postmasters and Assistants Association (CPAA). 1981 On October 16, Canada Post Corporation (CPC) was born as a Crown Corporation and was ordered to develop a business plan. The Deputy Postmaster General was removed. A Cabinet Minister was named as the person to whom the newly appointed CPC President, Michael Warren, was to report to with a business plan. CPC had to also plan for employee benefits which had previously been supplied by the Treasury Board. 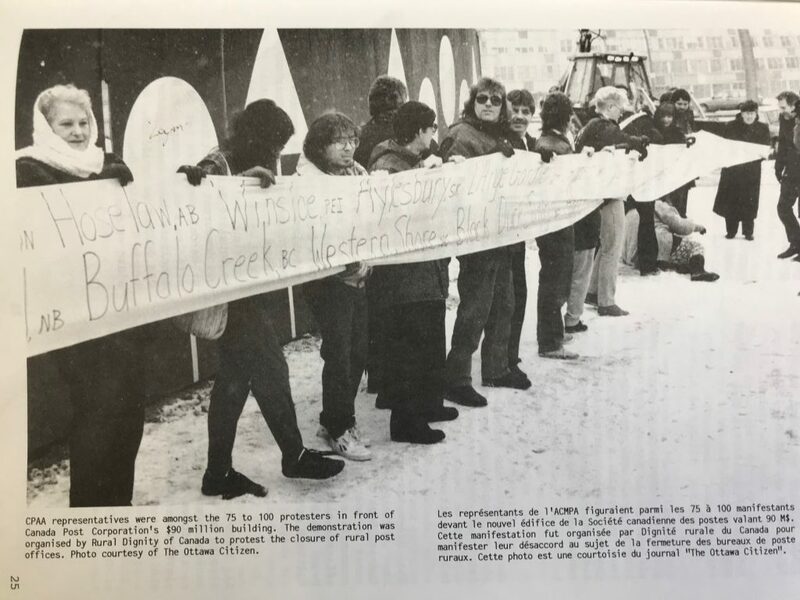 1982 CPAA filed a pay equity complaint with the Canadian Human Rights Commission, alleging that CPC was paying CPAA members differently from workers in another bargaining unit. 1985 CPAA and CPC attempted unsuccessfully to settle the pay equity complaint on their own. Following these attempts, the Human Rights Commission reopened the case in 1989 and reviewed the settlements that they had been able to reach. It then decided to close the case. 1986 As a Crown Corporation, Canada Post has always seemed to change direction according to the ideology of the government of the day. Its business plan under the Mulroney Conservative federal government meant the total elimination of the Canadian Postmasters and Assistants Association. The plan called for the closure, amalgamation, or privatization of all 5,221 post offices in rural Canada, virtually every post office within the CPAA bargaining unit. In 1986, a strategy committee was struck to devise a plan to stop the Corporation and the Conservative Government from proceeding with their business plan. This committee resulted in an organization called Rural Dignity. 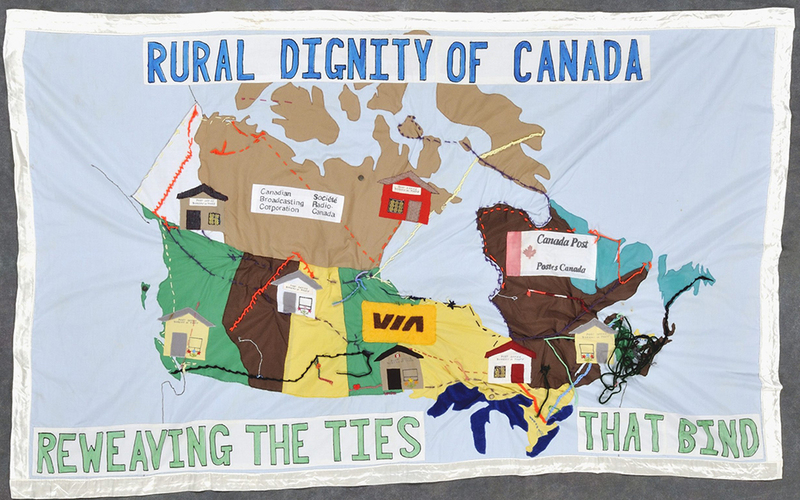 Cynthia Patterson of Rural Dignity and CPAA members worked with municipalities, organizations, customers, and citizens of rural Canada to stop the government from closing, privatizing, or amalgamating our rural post offices. 1987 CPAA is faced with a challenge from both the Canadian Union of Postal Workers (CUPW) and Canada Post Corporation before the Canadian Labour Relations Board to create one large bargaining unit for all CPC employees. Two years later, in 1989, the Board ruled that CPAA would remain a distinct bargaining unit. 1989 On September 18, at the Biennial held in St. John’s, NF, the membership voted to add another full-time National Vice President position, and to make the National Secretary-Treasurer’s position an elected position rather than an appointed one. The Secretary-Treasurers in the branches would also become executive officers with a full vote and voice. At that same convention, the membership voted to go to a Triennial Convention instead of a Biennial. 1991 In preparation for the federal election, a second Strategy Committee was formed with the mandate to make rural post offices an election issue. In 1993, the Progressive Conservative Government was soundly defeated. Prior to the election, CPAA obtained a letter from Jean Chrétien stating they would establish a moratorium preventing further post office closures in rural Canada. While the moratorium has remained in place, Canada Post Corporation has continued to close rural post offices wherever it could; for example, with the retirement of Postmasters. 1993 CPAA filed another pay equity complaint with the Human Rights Tribunal, alleging that CPAA members were being paid less for work of equal value than the male-dominated PO and PO EXT Groups (CUPW) and that, in spite of past settlements and efforts to achieve pay equity, Canada Post was discriminating by using different work evaluation systems for the various groups of employees. A protracted legal battle ensued over many years, with numerous delays from CPC. 1995 The government ordered a complete review of Canada Post, from mail delivery to whether CPC was competing fairly in the marketplace. In 1996, George Radwanski was appointed as Chairperson of the Mandate Review Committee. CPAA submitted a brief to the Committee addressing the importance of postal service in rural communities. The Maritime Branch and the Québec Branch also submitted written briefs. The National office, the Maritime Branch, and the Québec Branch gave presentations at the hearings in Ottawa, Halifax, and Montreal respectively. Six hearings were held across Canada: Vancouver, Winnipeg, Toronto, Ottawa, Montreal, and Halifax. The final report and recommendation of Mr. Radwanski was completed by July 31, 1996 and presented to the government. The report made 31 recommendations. Of great importance to CPAA was that Canada Post’s exclusive privilege in lettermail would be retained, and that the universality of services would be regarded as an integral element. It also stated that the moratorium on rural post office closings has been indefinitely extended and the services in rural areas be improved, not reduced. 1997 On April 23, Diane Marleau, the Minister responsible for Canada Post Corporation released a report, completing the review of the mandate of Canada Post Corporation. Of great significance to CPAA was the government’s promise not to privatize postal service and its confirmation that the Corporation’s mission was to provide affordable, universal postal service. The report also established service standards for rural Canada to be monitored independently. 1997 The CPAA held its first training for members, the JUST FOR YOU course, which it continues to offer biannually to members from across the country. 1998 The Quebec Branch delegation raised issues of representation, communication, and the recognition of their language. A committee was formed to resolve the language issues, resulting in the creation of two National Vice President positions: one English and one French. 2001 At its Triennial Convention, the CPAA elected its first female President, Leslie Schous, as well as its first female Secretary-Treasurer, Claire Wierzbicki. The second female President, Brenda McAuley, was elected in 2013. 2002 This year marked the 100th anniversary of the Association. The Corporation began again to close post offices but agreed to hold off at least until its negotiations with CPAA were ended. 2003 Canada Post agreed to recognize rural route contractors as employees represented by CUPW, now known as Rural and Suburban Mail Carriers (RSMCs). CPAA objected, arguing that employees working in CPAA offices should belong to our bargaining unit. In 2005, CPAA signed a memorandum of agreement with CUPW that a bargaining unit made of Rural & Suburban Mail Carriers was appropriate and CUPW agreed to respect the separate bargaining rights of CPAA members. A joint committee to discuss issues of common interest was also agreed to. 2008 The Conservative federal government introduced Bill C-14, which would partially deregulate Canada Post exclusive privilege to deliver international letters. On April 21, 2008, the Minister responsible for Canada Post announced a strategic review of Canada Post Corporation and the creation of an independent Advisory Panel to conduct this review. Also in 2008, the Canadian Union of Postal Workers wrote to CPAA proposing the two unions create a committee to look at the possibility of a merger. This proposal was rejected by CPAA leaders. In 2010, CUPW applied to the Canada Industrial Relations Board (CIRB) for a bargaining unit review to force a merger with CPAA. In 2011, the CIRB dismissed CUPW’s application. CPAA filed a complaint with the CLC charging CUPW with raiding them. In 2012, CUPW agreed to abide by the CLC Constitution and promised not to raid CPAA. 2013 In December, Canada Post announced a program of heavy cutbacks and privatization supported by the Conservative government. As part of this plan, Canada Post began in 2014 to slash hours in our CPAA offices, making us less convenient so customers would use privatized franchises. CPAA fought the attack on rural post offices. We sent letters and also postcards for MPs to communities where CPC was downsizing postal service. Thirty-two thousand post cards went out and our collective efforts helped stop Canada Post’s cuts. We wrote articles expressing how the plan to promote franchises would affect our members and ultimately result in the privatization of Canada Post. We also commissioned two studies to support our fight to restore postal banking in our offices: Rural post offices and the communities that rely on them are being abandoned and Why Post Offices Need to Offer Banking Services. In 2014, we learned that Canada Post had been secretly conducting studies on postal banking, which were almost entirely censored. 2015 The fight against the cuts at Canada Post made them a top federal election issue and helped unseat the Conservatives. The newly elected Liberal government committed to review Canada Post and to not privatize it. 2016 The review of Canada Post began with a four-member Task Force, which undertook an analysis of Canada Post’s services and financial situation, conducted public opinion research, met with key stakeholders, and examined international best practices for postal delivery. The resulting discussion paper, Canada Post in the Digital Age, was produced, in which the recommendation to close 800 of the most lucrative CPAA public post offices and replace them with privatised franchises was one option proposed. This was shocking to CPAA as we had sent the committee our study clearly proving what happens to rural communities when a corporate post office is replaced with a franchise. In such communities, the chance is 55% that the franchise would close, leaving the community with no post office. The Task Force also dismissed the postal banking study. As we review Canada Post, we need to consider what a 21st century post office could do for us. Canada Post has the largest retail and distribution network in this country, linking Canadians, nationally and internationally. To this day, it remains the hub of rural communities as it has been for over 100 years. 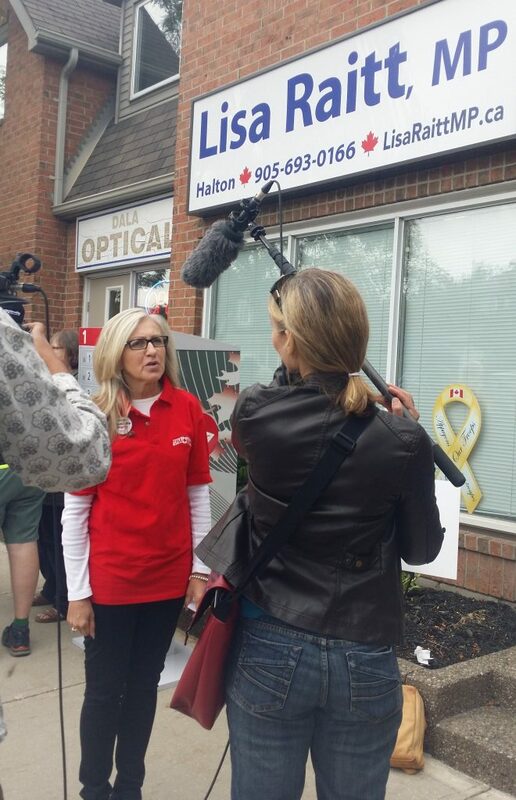 A retailer has to look to the future, otherwise they will die in the past… What if we used Canada Post’s vast network to deliver the kinds of changes Canadians really want – environmentally friendly options that support rural and Indigenous communities and local businesses? For example, electric charge stations at all suitable Post Office locations and while your car is charging you could do your postal banking at the same time. 2017 The Standing Committee produced its report The Way Forward for Canada Post. We were pleased with some of the recommendations, such as using the post office as a community hub and delivering new services such as broadband and wireless. The Committee was privy to Canada Post’s secret studies on postal banking, the uncensored parts of which indicated that it would be a “win-win” for the post office. Its report opened the door for Canada Post being able to offer some financial services, at least in rural and remote communities. 2018 On January 24, 2018, the government announced a new vision for Canada Post, which included references to innovation and service expansion, and confirmed there would be no further cuts. Subsequently Canada Post put a freeze on all office reductions that would affect hours to the public and dropped 34 grievances it had filed against CPAA for not agreeing to close post offices on Saturdays. The Corporation’s finances were also reclassified, permitting Canada Post to reinvest all its profits in service and innovation. In March, CPAA for the first time represented women working in rural Canada internationally at the United Nations during International Women’s Week. On October 17, 2018, the CPAA board of Directors met with many Members of Parliament to lobby for increased services in our post offices in advance of the second reading of M-166, a private member’s bill introduced by NDP MP Irene Mathyssen (London-Fanshawe) to restore postal banking. While M-166 did not pass, Postmasters again made their presence known and felt in Ottawa. The 1993 pay equity complaint began to move forward again and CPAA hired an expert to review some of the previous findings. The parties agreed to mediation beginning in early 2019. If a settlement is not reached, the Human Rights Tribunal will hold hearings in the summer of 2019. No matter the year, no matter the century, CPAA is always working hard to obtain the best possible benefits for the members of our Association!